As infants sleep over 16 hours per day a crib mattress should be carefully chosen as it would be the most single item with the highest impact on the quality and safety of your little one. You will see below there are several common misconceptions regarding crib mattresses among new parents. The amount of models to choose from also does not make choosing any easier. Below we present most popular baby crib mattresses and a shopping guide outlining crucial features. Along with most advanced and pricey designs are also proven yet affordable options. As you’ll see the best crib mattress does not mean the most expensive one. See the list of models followed by a short description. 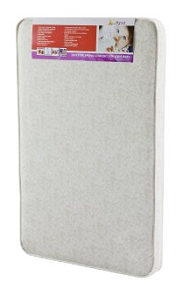 Simple, safe and attractively priced mattress made of firm and high-density foam. This model weigh just 11.5 pounds so will be easy on your back. Despite its low price it’s made of high quality materials and comes with a 10 year warranty. The foam is made of special phthalate-free form of polyurethane that has antimicrobial qualities. It also prevents growth of mites and protects from allergies. This memory foam mattress is easy to use due to light weight as well as well design cover (included) that is water resistant. This means that and spills will not penetrate into the mattress and are easy to clean up with a damp cloth and soapy water. The cover can also be easily removed and machine washed. It is vacuum packed so there would be no problem with carrying it from the store or ordering online. Once unpacked it will “inflate” and adopt its final shape within 24 hours. The mattress is firm enough to withstand baby’s weight and thus safe to use even with infants. Having standard dimensions (51-5/8″ x 27-1/4″ x 5″) it also poses no risk of entrapment. It is also made of non-flammable materials and meets Consumer Product Safety Commission standards. The growth of mold, bacteria and mites in the mattress is addressed with special formulation of the foam as well as a waterproof mattress cover. This mattress comes from a manufacturer with over 160 years of experience in sleep products. The addition of natural, US sourced soybean oil makes it eco-friendly option and also enhances physical parameters of the product. Meticulous design as well as production process with 60 quality control stages contributes to the very high quality of this crib mattress. As there are no room for imperfections this model comes with lifetime warranty. 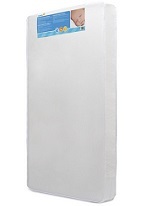 The ease of use is guaranteed by its light weight (only 8 pounds) and waterproof cover (both fabric and seams) that can be cleaned with cloth or baby wipe. The mattress is firm and poses no risk of suffocation. The dimensions are in accordance with US regulations, 51.63 x 27.25 x 5 inches. The materials used do not release toxins into the air which was tested and certified by Greenguard Gold. One of the most affordable mattresses on the market! To keep the price down its design was focused around simplicity and safety. The core of the mattress is made of fibers that have thermal insulating properties and thus your baby will be well protected against temperature changes. Orientations and structure of the fibers makes it firm and helps to quickly return to original shape after being compressed. This helps infants to change position. Despite its low price the quality of materials is high and thus it’s not only safe and comfortable but also due to light weight (7 pounds) easy to lift if needed. Standard dimensions (52.5 x 27.5 x 5.5 inches). 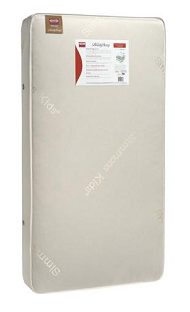 Reasonably priced, high quality innerspring mattress that could serve your little one for years. 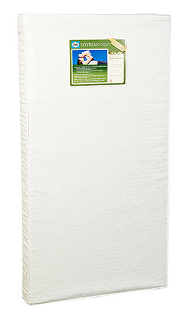 One side of this mattress is firmer and thus safer for newborns and infants. The other side is softer hence provide additional level of comfort once your baby become older. Many parents who bought this mattress praise it for the lack of any chemical smell. The quality of materials is also very high so it’s not surprising that Simmons offers a lifetime warranty for this model. It is made in the US and exceeds fire safety standards. 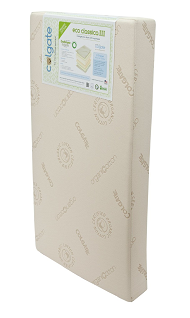 Purity of the air around this crib mattress and lack of chemical being released was tested and it bears both CertiPUR-US and GrenGuard Gold certificates. In terms of everyday use this design is heavier (15 lbs.) then previously mentioned foam-based mattresses. It also comes with water and stain resistant cover made with medical grade materials. Extremely popular mattress that after recent price drops became also the best seller among most baby stores. When searching for best crib mattresses it’s just impossible not to see what Graco has on offer. This US based company is famous for high quality of their products and excellent customer care. They also often shock competitors and change the status quo by offering fine products for absolute bargain prices. It’s exactly what they did with their foam mattress for baby cribs. But what can you expect from a mattress for $35? It seems that quite a lot. It’s firm which makes it safe and very light (3 pounds) which every parent would appreciate. Graco’s Dream On Me mattress would probably meet most parents’ expectations and predominantly high review scores of this product evidently suggest that. The only concern some parents have is that the corners are slightly rounded. Just to be on a safe side it’s a good idea to fill a space between the crib and the mattress with a blanket. Waterproof cover makes it easy to keep clean and prevent bacterial and mold growth. 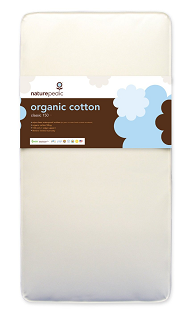 This premium mattress is made of organic materials and designed to offer ultimate comfort to your baby. 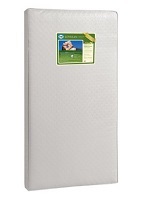 The mattress is supported by 252 coils and padded with organic cotton. To provide additional level of comfort and safety there are additional structural elements supporting the edges. 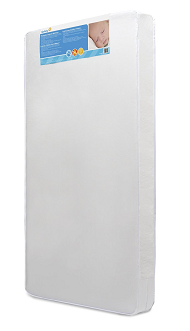 This ensures perfect shape of the mattress no matter if the baby sleeps in the center of the crib or close to the side. As most innerspring mattresses it can be used for both infants (firmer side) and toddlers (softer side). To prevent entrapment hazard its dimensions are exactly according to regulations (27.75″ x 52″ x 6″) and it comes with square corners to provide tight fit. One may think that when you pay almost $400 you can expect the crib mattress to be just perfect. It certainly looks, feels and smells (or rather lacks any smell) like an adequately to its price. It’s not so perfect when it comes to handling as this model is just heavy. In fact weighing almost 26 pounds it’s the heaviest mattress on our list. Produced by manufacturer with over 50 years’ experience. 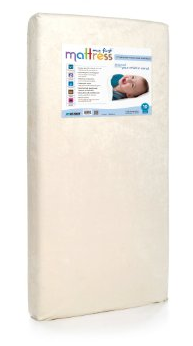 This foam mattress features firmer side for newborns and softer for toddlers. The materials meet strict standards and are certified by specialists in fire safety and chemical hazards. To ensure highest quality of the foam and prevent emission of toxic agents the foam is made with natural plant oils, not petroleum based compounds. Colgate’s mattress is comfortable in everyday use as it’s only 8.5 pounds and comes with a special triple layered cover. This makes it not only water and stain resistant but also very durable and hard to tear. Both the foam and the impenetrable for dust, dirt and mites cover provide safe and hypoallergenic environment. How to Buy the Best Crib Mattress for Your Baby? There are several factors you need to have in mind when choosing a crib mattress. Some of the features influence the safety and comfort of your little one, others can make your life easier. There are two types of crib mattresses: foam-based and coil-based. The first ones are generally cheaper and lighter. They are also easier to transport and often shipped in a vacuum packaging (regain shape in 24 hours). 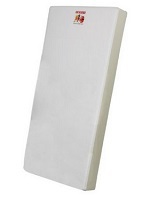 Due to its light weight it is easier to hoist a foam mattress. This may be important as changing sheets after baby’s spit-ups, bottle spills or diaper leakages are a common task for newborns’ parents. The innerspring mattresses, before recent advances in foam production technology, were more durable and resistant to deformation caused by the weight of the baby. Some manufacturers also claim that their innerspring mattresses are made of organic materials and thus safer as no chemical agents are emitted. However, the organic materials are often just an addition and according to the law it is enough to include 5% addition of organic materials in a product to call it “organic”. Traditionally an important advantage of a coil-based crib mattress was the ability to serve both infants and toddlers are one side is often firmer while the other is softer. Once the baby grows you can flip the mattress and there is no need to buy a new one. Recently more and more foam-based models are also double-sided. The weight of the mattress is important not only when it’s being carried from a car into baby’s room. You will have to be able to lift at least one corner of the mattress with ease when a diaper spills and a sheet has to be washed. This may happen in the middle of the night and you will most probably have to do it with one hand while carrying your little one in the other. You will also be regularly hoisting up either one side or the whole mattress to change the sheet. A good baby crib mattress must be firm. Your baby is much lighter than you so soft surface is not necessary for comfortable sleep and in some situations it may even be dangerous. Too soft mattress may pose a suffocation hazard therefore you want to look for firm ones. It should also quickly regain its shape after being compressed. If it does not get back to its original shape promptly it will be difficult for the baby to change his position. The mattress should fit tightly in the crib and there should be no space between them that would pose an entrapment hazard. In the US the dimensions of all baby mattresses are specified (27 1/4 inches by 51 5/8 inches and 6 inches thick) you can only buy those that are exactly the right size. If you’re buying from overseas you may use a “two finger test”. Try to fit two finger in between the mattress and the crib, if you can’t it’s fine. Most mattresses come with water and stain proof covers. This type of cover usually also protects against dust and mites. The difference between covers lay often in the feel of the fabric. Some of them are pleasant in touch and some are rather plastic and make rustling noise when the baby moves.